In this ABCmouse review, I’ll try to answer all your questions about the product. I’ll also show you some screenshots and give you my honest opinion, but if I forget something, please let me know. I’ve searched the entire internet to find the best tools to use with my daughter. She is only 2 years old now, but I feel like it’s important that she learns as much as possible at home before she starts school. So, I landed on ABCmouse.com. ABCmouse.com offers a comprehensive educational program for young children. It was developed by the Age of Learning, Inc.
Just to be clear, ABCmouse is not an accredited school. However, it is an extremely useful supplementary tool used by librarians, teachers, parents who home-school, and parents who just want an additional learning resource for their kids! The vast material on this site includes 9,000+ individual learning activities and over 850 lessons. It’s designed for toddlers up to those in second-grade, this site distinguishes between individual ages and abilities with 10 separate learning levels. These levels are selected by the parent and can be changed depending on if the material is too challenging not quite challenging enough for the individual user. The curriculum on this site has received awards like the Mom’s Choice GOLD Award and the Teachers’ Choice Award. The educational program was designed in collaboration with a versatile curriculum board of experts in early childhood education as well as field-specific experts. Examples of these experts include a Ph.D. of Curriculum Development holder, a geologist and science education specialist, and an experienced lexicographer (someone who complies dictionaries). The curriculum on this site is divided into four subjects: reading and language arts, math, “the world around us” (which includes lessons on the body and health, plants, world maps, the solar system, etc.) and arts and colours. The site also uses a wide variety of lessons types, including 450+ books, songs, puzzles, and games. Diversity amongst lesson styles helps children with different learning methods succeed in all subjects. This platform is a paid, subscription-based site. So the big question is, is it worth the money? There are lots of free websites that offer educational content for young children. For example, pbskids.org offers many games and lessons through a variety of mediums for free. However, a subscription on ABCmouse.com costs $9.95/month ($79.99/year). This fee can be paid monthly, yearly, or in 4 installments with a credit card, PayPal or Apply Pay. Despite having a lot of competing free options, the benefits a user gets from a platform that requires subscription are quite clear. Most importantly, ABCmouse.com is an advertising free, external-link free site that is safe and secure for young children to use with minimal supervision. Although the sites creators recommend parental supervision, especially when first navigating through the various features, the site is safe for children to use independently. This is really what sets this site apart. Parents can be comfortable concentrating on other tasks while their children learn and have fun in this interactive online platform. Additionally, the fee contributes to the high quality of the curriculum mentioned previously. The fee also allows for developers to work on creating a child-friendly, stimulating platform. An example of just how child-friendly this site is can be demonstrated with the audio features. Firstly, don’t forget they are currently offering a 30-day free trial, you can sign up for a free 30-day trial here, although you will have to enter payment information. So, if you and choose not to continue using them, don’t forget to cancel. When you create an account, you’ll register one parent profile and up to three child profiles, which you can use simultaneously on different devices. Next, parents will have to decide what level to place their children in. There are 10 levels, that becoming increasingly difficult. The first sets of levels are geared towards toddlers, preschoolers, pre-kindergarteners, and kindergarteners. The higher sets are geared towards first and second graders. The lessons are briefly described during registration, but don’t fret if you are unsure. There is a detailed description in the Parent section, and the parent can change the child’s level at any time during the subscription. After parents choose a level, children choose an avatar from a pre-made list or they can create their own at no extra charge. After registration you will be brought to the Student Home Page. The first feature on this page is called the “Learning Path”. After selecting the child’s level during registration, this creates a specified learning path geared towards that age group and ability level. The Learning Path is structured like a trail. Along each step of the trail, the child is presented with a lesson, and once completed they get to advance to the next lesson. Each time a lesson is completed, the user earns tickets. These tickets, and the reward system they create will be discussed a little latter on. Along the trail students will also get surprise rewards for every set of lessons they complete. They can track their progress from a bar along the bottom of the page. Additionally, the trail goes through a variety of environments, each of which include key facts about the climate and vegetation of the area. As children move along the trail, the lessons get more complex, and the rewards can become greater. This phased pre-set lesson plan is one of the best features on the site. It continues to challenge children every step of the way, whilst rewarding them for their progress. ABCmouse.com also includes more freely structured lessons about basics of letters and numbers, music, books, calendars, the solar system, and more, which are accessible from the Classroom. The activities housed in this feature do not count towards the Learning Path progress but are still tracked for parents to see. All the work users do in their classroom will still yield tickets to use in the rewards system. By now you’re probably wondering, what is this reward system anyway? When you first sign up, each user gets a ‘Room’, ‘Aquarium’ and ‘Pet Place’ in addition to all the lessons. These features are interactive and allow students to learn but are more importantly the place where a student can use their rewards. As users’ complete activities, they are rewarded with tickets. Different amounts of tickets are rewarded depending on the difficulty of the lesson, and extra tickets are rewarded along the Learning Path as incentive for kids to complete more lessons. Tickets are essentially virtual cash that the child can use in the sites shopping center. Here, users’ can use their tickets to purchase items to customize their avatar or they can purchase items for their room, aquarium, and pet place. They can also purchase pets and take breaks from lessons to care for or play with the pets. Once they have purchased something new, they can interact with it in the specific space it was designed for. The more valuable, exciting items for sale are obviously more expensive, and therefore encourage saving on behalf of the users. Giving students rewards for their work, encourages students to continue to work harder, as long as the rewards remain important to the recipient. Some of the most important benefits offered by ABCmouse.com have already been mentioned. This site has an extensive curriculum built in collaboration with teachers and education experts that offers wide-ranging lesson options targeted to young children. The fee required by this site ensures that it remains ad-free and safe for kids to use with minimal adult supervision. The fee is also quite reasonable considering that one account can be shared between three children of different ages and abilities. Parents can also opt in to an option called the “Assessment Center”, which offers a variety of tests to assess the areas in which a specific child can improve in. 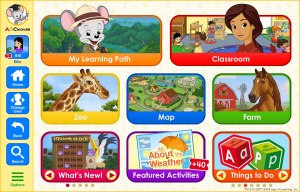 There are a lot of free sites with educational games and lessons for young children, but they do not offer the structure and safety that are inherent in ABCmouse.com. One of the other major benefits of this website, over it’s alternatives, is that it offers parents a lot of control. The password-protected Parent section is easily accessible from any options menu on the site. This page includes sub-sections to purchase the assessment center, view details about the account, change settings, take an in-depth look at the curriculum, access customer support, and provide feedback. 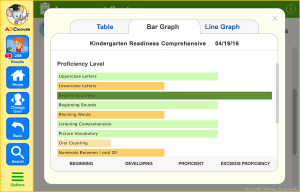 This page also allows you to access the Progress Tracker, which allows parents to follow their child’s/children’s accomplishments on the site. This visually appealing tracker has easy to read graphs and charts that demonstrate the number of lessons completed, and of what type or subject they are in, as well as how many tickets are being collected and spent. The best part about this Parent feature is that parents can customize the settings for their children’s accounts. For example, parents can restrict ticket spending to require their password, they can change the Learning Path level if the profile is too easy to difficulty, and they can set restrictions for how long the child can use the website a day. Additionally, the site offers an “Assessment Center”, which contains tests to determine where your child stands on certain skills. This feature often requires parental supervision when completing the tasks and has additional costs. Although many other sites have educational tools, few offer the control and administrative capabilities that ABCmouse.com offers its customers. In my opinion, it’s definitely worth the money. So, the importance of early education is undeniable. But I’ve contemplated just using free stuff online, rather than paying for a premium service like this. However, i’m getting more and more fed up of the Ads and I also find the quality of the education is not as good. So, I am a customer of ABCmouse and I am very pleased with their product so far. I also tell myself, I pay $11.99/month for Netflix, which has no educational value for my daughter. So, of course I can justify paying $9.99/month for ABCmouse.com! p.s. Don’t forget to give it try with their 30-day free trial. Use this link. ← Will Ramaphosa’s Investment Summit Deal Major Changes in South Africa’s Development?